This notice sets out the information collected about you through the use www.stdunstaninn.co.uk and any other electronic communications networks by St Dunstan Inn. From time to time we may change this privacy notice. You may therefore wish to check this page from time to time to ensure that you are happy with any changes. The latest privacy notice will always appear on this page. If you have any questions or comments about this privacy notice, please contact us. For more information on cookies and their uses, visit All About Cookies. We use Google Analytics to collect information about how our visitors use and navigate this website. The cookies collect information such as the number of visitors to the site, which pages they visited and whereabouts they came to the site from. This information is anonymous and cannot be used to identify you personally. 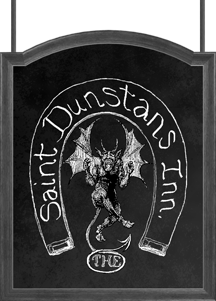 During your visits to the St Dunstan Inn website you may be delivered cookies by third-party websites. When you visit a page with content embedded from, for example, Google Maps, you may be presented with cookies from these websites. St Dunstan Inn does not control the dissemination of these cookies. You should check the third-party websites for more information about these.